… and I’ve tried a lot over the years. I think I’ve finally perfected it – this is the version my family enjoy anyway. You could just use Cheddar cheese but the combination of the two different cheeses gives it a lovely taste and an appetising depp golden colour. Meanwhile, start making the cheese sauce by melting the butter in a saucepan. Stir the flour into the melted butter. It will make a thick paste. Stir approx a quarter of the milk into the butter and flour paste. Keep stirring until you get rid of any lumps. Then stir in the remainder of the milk. Carry on stirring the sauce over a high heat until it thickens (typically 2-3 minutes but it can take longer). 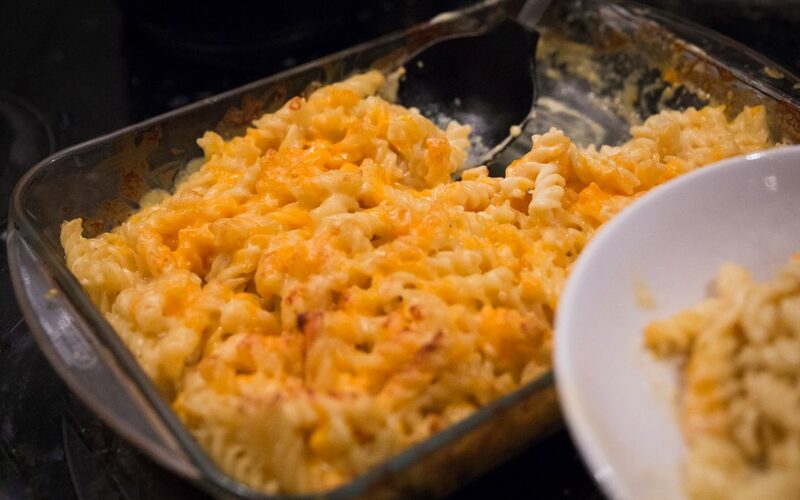 Put 2 heaped tablespoons of cheese to one side so you can use it on top of the bake later. Add the rest of the grated cheese to the sauce. Stir it in with the mustard powder and the pepper. You should now have a good, thick cheese sauce. Pour the sauce over the cooked pasta and stir the whole thing well so that all the pasta pieces are coated. Sprinkle the top of the mixture with the grated cheese that you put aside earlier. If you aren’t embracing Meatfree Mondays or can’t bear to eat a meal without some form of meat, try frying some bacon pieces or chopped up chorizo and add to the dish before you put it in the oven.